Dujovne said that about $15 billion from the credit line would be immediately available to Argentina after the package is approved by the IMF’s board, which is expected on June 20. 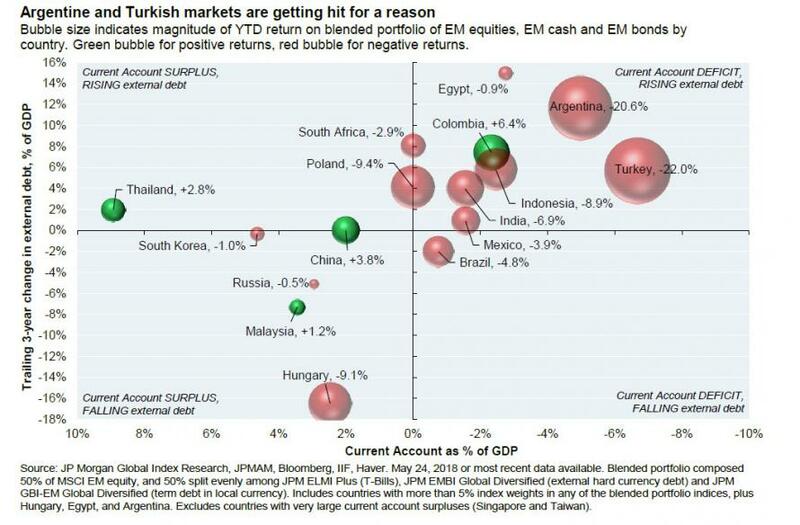 The rest would be dispersed as needed as Argentina meets its targets. "It’s very good news that the integration with the world allows us to receive this support." ... but also hinted that the international community would also foot the bill for all other upcoming Argentinian bailouts. And if the country's history is any indication, there will be plenty more, as well as the occasional military coup for good measure. According to Bloomberg, Argentina will see 30% of the funds a day or two after the Fund’s June 20 board meeting, and in typical IMF-bailout fashion, a form of austerity will be imposed on what was once Latin America's richest nation: as part of the agreement, the country will now target a fiscal deficit of 1.3% of GDP in 2019 and 2.7% this year, with a fiscal balance targeted for 2020 (good luck). And since the previous targets of 2.2% and 3.2%, were almost as laughable, this latest IMFian austerity package not only has zero chance of ever being achieved, but if Greece is any indication, it will make the Argentina crisis far worse. The government has also set a new inflation target of 17% in 2019 - It's considered low - declining to 13% in 2020 and 9% in 2021. And the biggest joke, as part of the program, Argentina will agree to accelerate the pace at which it reduces the government deficit. The nation spends more than it collects in revenue and imports more than it exports, creating fiscal and current-account shortfalls that leave Argentina vulnerable to fluctuations in its currency. But, thanks to the even more idiotic policies of central banks, Argentina managed to sell a 100 year bond last year, demonstrating just how stupid some managers of "other people's money" really are. “This is a plan owned and designed by the Argentine government, one aimed at strengthening the economy for the benefit of all Argentines,” IMF Managing Director Christine Lagarde says in the statement which can be found on the IMF's website. To take effect, the deal reached between the IMF’s staff and Argentine authorities still requires the approval of the IMF’s executive board. Oh, and thank you American taxpayers: the IMF’s largest shareholder, the U.S., said in a statement Thursday from Treasury Secretary Steven Mnuchin that it supported the program, according to the WSJ. “The size of the package should provide relief, but implementing the program entails significant challenges and will require skillful political leadership,” said Martin Castellano, the head of Latin America research at the Institute of International Finance. 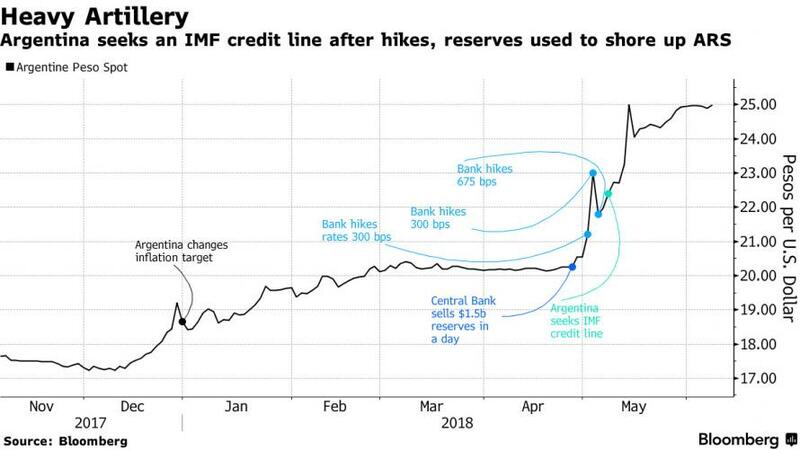 Argentina was bailed out by the IMF for the second time in 2 decades after three rate hikes pushed borrowing costs above 40% but failed to halt a plunge in the currency. The peso fell 25% against the dollar this year to trade at 24.9850 on Thursday, while capital outflows soared. Central Bank President, Federico Sturzenegger, said the bank will continue to intervene in currency markets in times of “disruptive movement" although the central bank will not target inflation this year, he said. Meanwhile, the government has agreed to send a bill that gives the central bank more autonomy, and as a result it wil no longer transfer funds to the Treasury. "We’re convinced that we’re on the right track, that we managed to avoid a crisis, gather support for the program we already had and that has been in place since Dec. 2015, which looks to build a normal economy, reduce poverty and protect the vulnerable," Dujovne said, echoing what Greece said after its first bailout 8 years... and its second... and its third. Well, he may want to take a look at Brazil. As for what happened the last time the IMF bailed out Argentina in the early 2000, the following 2004 article from the Telegraph tells you all you need to know why when a nation is desperately in need of deleveraging, giving it another $50 billion in debt is generally a bad idea. The International Monetary Fund yesterday admitted that its mistakes helped plunge Argentina deeper into the red during the currency crisis that crippled the country's economy three years ago. In a report published yesterday by its independent evaluation office, the IMF said it ought to have prevented the Argentine government from following poor economic policies. "IMF surveillance failed to highlight the growing vulnerabilities in the authorities' choice of policies and the IMF erred by supporting inadequate policies too long," it said. The financial meltdown that reached a climax in 2001, causing the country to default on $132 billion of foreign debt, was worsened by the government's vain attempts to maintain the Argentine peso's peg against the dollar. The IMF ploughed money into the country to help it sustain the peg, pledging an extra $22 billion as late as the end of 2000. "In retrospect, the resources used in an attempt to preserve the peg could have been better used to mitigate some of the inevitable costs of exit," the report said. Although it became clear to some IMF staff that the country's currency plan was flawed in the 1990s, they did not report their doubts to their board for fear of triggering a speculative attack on the peso. The executive board, for its part, ignored staff complaints that Argentina was not reforming its economy satisfactorily. Both the IMF and the US touted the country as Latin America's economic success story but the fund maintained its support despite the fact that Argentina missed its fiscal targets every year since 1994. Analysts have also claimed that the IMF's demands that Argentina raise taxes in 2002 worsened the crisis. The conclusions will come as a blow to the institution, whose role has come under increased scrutiny in recent years. Yesterday the Argentine finance minister, Roberto Lavagna, argued that the country should not be pressed too hard for repayments of its current three-year $13 billion loan. He said the IMF was now insisting it reformed its economy "in a way absent throughout the 90s" and "under a schedule that is oblivious to the political realities of the country". Good luck, and some advice to Argentina: this time try to prevent Elliott Management from buying up your debt at distressed prices.